Diets rich in meat are claimed to contribute to the high tissue arachidonic acid (20∶4ω6) content in people in Westernized societies, but there are very few direct data to substantiate this assertion. Because meat contains a variety of long-chain polyunsaturated fatty acids (PUFA) that are susceptible to oxidation, we initially examined the effect of cooking on the long-chain PUFA content of beef, and then determined the effect of ingestion of lean beef on the concentration of long-chain PUFA in plasma phospholipids (PL). First, we examined the effect of grilling (5–15 min) and frying (10 min) different cuts of fat-trimmed lean beef on the long-chain PUFA content. Second, we investigated the effect of including 500 g lean beef daily (raw weight) for 4 wk on the fatty acid content and composition of plasma PL in 33 healthy volunteers. This study was part of a larger trial investigating the effect of lean beef on plasma cholesterol levels. In the first two weeks, the subjects ate a very low-fat diet (10% energy) followed by an increase in the dietary fat by 10% each week for the next 2 wk. The added fat consisted of beef fat, or olive oil (as the oil or a margarine) or safflower oil (as the oil or a margarine). This quantity of beef provided 60, 230, 125, 140 and 20 mg/d, respectively, of eicosatrienoic acid (20∶3ω6), 20∶4ω6, eicosapentaenoic acid (20∶5ω3), docosapentaenoic acid (22∶5ω3) and docosahexaenoic acid (22∶6ω3). Grilling for 10–15 min, but not frying, of the fat-trimmed lean beef resulted in 20–30% losses of the 20 and 22 carbon PUFA. The consumption of the lean beef during the first two-week period, when there was a very low level of dietary fat, was associated with significant increases in the proportion and concentration of 20∶3ω6, 20∶4ω6, 20∶5ω3 and 22∶5ω3 in the plasma PL and a significant decrease in the proportion and content of 18∶2ω6. The addition of beef fat or olive oil to the diets containing lean beef did not alter the plasma PL fatty acid profile compared with the very low-fat diet, whereas the addition of safflower oil maintained the significant increases in 20∶4ω6 and 22∶5ω3 but led to decreases in 18∶3ω3 and 20∶5ω3 compared with the very lowfat diet. The results showed that diets rich in lean beef increased the 20∶3ω6, 20∶4ω6 and the long-chain ω3 PUFA levels in the plasma PL. 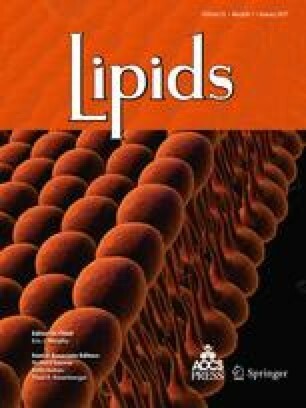 A high level of linoleic acid in diets rich in lean beef prevented the rise in the plasma level of 20∶3ω6 and 20∶5ω3, two fatty acids known to antagonize the effects of 20∶4ω6 on platelet aggregation.